Here we present a set of Frequently Asked Questions for CPES, our Smiths Clear Penetrating Epoxy Sealer CPES FAQ. If you do not find an answer to the question you have please use the contact form to ask us. 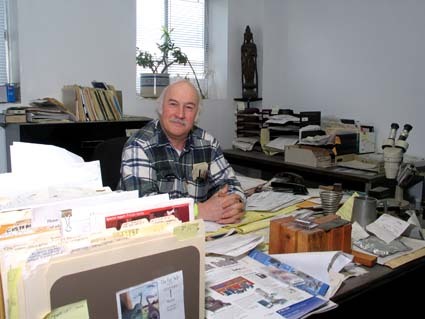 If we don’t know, we will ask the inventor; and if the answer isn’t somewhere in that pile of papers, it probably does not exist! What is the difference between Cold and Warm weather formula? The solvent blend in Cold Weather formula is designed to evaporate more rapidly, making it suitable for use in colder climates and better for rotten wood consolidation. Once the solvents have evaporated the resins that are left are identical to the resins in Warm Weather formula. This article will show you how to choose the right temperature CPES for your job. Will Paint or Varnish Stick to Smiths Clear Penetrating Epoxy Sealer? Oh yes, and far better than to wood itself. The product is sold in America as MultiWoodPrime for this very reason. Wooden boats stay varnished for far longer, houses stay painted longer. Click here for further details. How much of the old paint will I have to remove? Perhaps 95%. Clear Penetrating Epoxy Sealer will not soak through old paint, but if the remaining paint on the wood is in spots smaller than 3 – 6mm (1/4″ – 1/8″) the CPES will soak around and under the old paint. It may, however, cause the edges of the old paint to curl up. You may have to sand the wood and apply CPES again. How much rot do I have to remove before applying the sealer? Whatever can be scrabbled away with the bare finger tips should definitely be removed. Light brushing with a wire brush easily removes badly deteriorated wood. Authors note here. You can with CPES turn rotten wood dust, that can be crumbled in the fingers, into a block of solid plastic. You will use a fair bit of CPES to do this, but sometimes it makes sense to me to do so. For example if I am trying to repair timber with a tricky profile I may well choose to keep the rotten pulp, and harden it to useable, as it can make the job of filling far easier later. It’s a trade off with a bit more money on CPES to save a bit of time. How soon can I paint the filler (Fill-It)? Do I have to prime it? The filler cures overnight and should be sanded before painting. CPES is an excellent adhesion-promoting primer for paint when the topcoat needs a primer, although most primers can be used. How does CPES age – when can’t I use it? 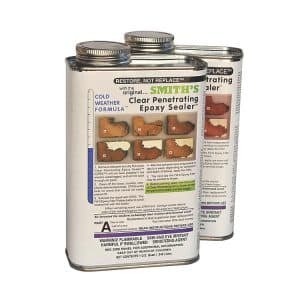 Smiths Clear penetrating Epoxy Sealer – CPES, ages by solvent loss. The unmixed resins won’t go off in the cans – they aren’t mixed, but the solvent blend will change due to the more volatile solvents preferentially dissipating. This will of course affect the penetration of CPES into the fibres of the wood that is being treated. If you know you put away a half can, and there is only a third of a can left – it’s time to buy fresh product. If in doubt, mix a bit and ask yourself ‘Is this the same water thin consistency that I remember? Does it penetrate wood with the same speed and efficiency?’. As an aside, if you can’t use what you have left, dispose of it as your local regulations would have you dispose of any other solvent based paint. How do I maximise the shelf life of Clear Penetrating Epoxy Sealer? Smiths CPES is best stored with the cans tightly closed in a temperature stable environment. As the CPES ages by solvent evaporation, a temperature stable environment minimises the solvent loss caused by the cans ‘breathing’ as the temperature rises and falls, and the internal pressure rises and falls as a consequence. A cellar is good, a garage less so. Yes, but you must provide adequate ventilation such as an exhaust fan in the window. It is also a good idea to wear a mask with an organic vapour filter cartridge when working with chemicals or solvents. Does it meet the Air Quality Management District regulations? Will wood repaired with Clear Penetrating Epoxy Sealer (CPES) pass inspection? The inspector usually stabs the wood with a screwdriver to see how easily it penetrates. After proper restoration the repairs will feel the same as new wood. If you can think of any answers that you would like to see on our Smiths Clear Penetrating Epoxy Sealer CPES FAQ page, please do let us know, and we will add them.